While most of us have just finished Fantastic Beasts, JK Rowling is again in news. No, not for a new book but for the rare handwritten copy of The Tales of Beedle the Bard, the storybook mentioned in The Deathly Hallows. It was also the fastest selling book of 2008. JK Rowling’s hand-drawn manuscript of The Tales of Beedle the Bard is going to be auctioned next month. It is the manuscript she gave it to the publisher who accepted the very first book of Harry Potter series. Sotheby’s is auctioning this rare, bejeweled and one of a kind manuscript on December 13 in London. 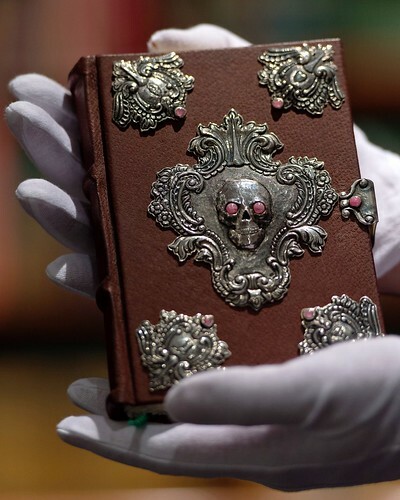 The guide price for the auction of this rare manuscript of The Tales of Beedle the Bard is set between £300,000 and £500,000 which is approx. $600,000. To Barry, the man who thought an overlong novel about a boy wizard in glasses might just sell … THANK YOU. The Tales of Beedle the Bard has great significance in the final book of the fantasy series Harry Potter & The Deathly Hallows. Albus Dumbledore leaves a copy of this storybook for Hermoine which contains clues that they use to destroy Voldemort. The personal resonance of this book makes this both an exceptional and highly desirable object to come to auction. It is particularly special as it is only one of six made for those closest to the author throughout the journey of creating the Harry Potter series, gifted to the man who recognised the brilliance of JK Rowling’s writing and her potential impact on children’s literature. said Dr Philip W Errington, director of Sotheby’s books and manuscripts department.